The Tiwi people have lived on Bathurst and Melville Islands for more than 10,000 years and their separation from the mainland has created a unique culture, music and artworks. North of Darwin lie a collection of islands that’s home to a people with a language and traditions vastly different to mainland Australia. The Tiwi people have lived on Bathurst and Melville Islands for more than 10,000 years and their separation from the mainland has created a unique culture, music and artworks. There are no didgeridoos or boomerangs here; instead they make music with clapping sticks, and are producing an entirely different style of art than we’ve come to expect from the Aboriginal arts movement. Guides tell the history of the Tiwi Dreamtime as they show off the islands through the Patakijiyali museum’s artefacts and photos in the Nguiu settlement on Bathurst Island. 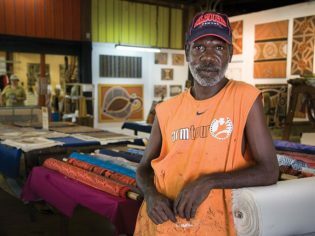 Amazing artwork on Tiwi myths, culture, flora and fauna is produced in the local art centre, and Tiwi guides talk of traditional materials created from the plants, as well as the history of the islands. The Morning Tea Ladies sit and chat away with visitors about life as they weave baskets, enjoy damper and tea and show off their individual totem dances. A permit is needed to go to the Tiwi Islands to be able to explore the town, beaches, bush and freshwater holes. A favourite pastime in Nguiu is Aussie Rules football, which is often played fast, furious and barefoot. The Grand Final attracts a big crowd of supporters who cheer even-handedly for both teams. Where? // On Bathurst Island, 80km north of Darwin in the Arafura Sea. Did you know? // The fictional “Mission Island” in Australia the Movie is actually Bathurst Island, and Nguiu was the first place in Australia to experience a foreign invasion when it was bombed in February 1942, moments before Darwin was attacked.